We are so excited for the seventh season of Game of Thrones, set to hit our telly screens on 16th July. But before we get back to Westeros, we are in need of a quick season 6 catch up guide! Meanwhile, in Dorne, Ellaria kills Prince Doran; and in King’s Landing, one of her daughters does the same to his son, Trystane. As for Daenerys, she’s found by a khalasar and placed in a temple to live out her life with other widowed khaleesi. Things aren’t looking good for Ayra either, who is a blind beggar on the streets of Braavos. 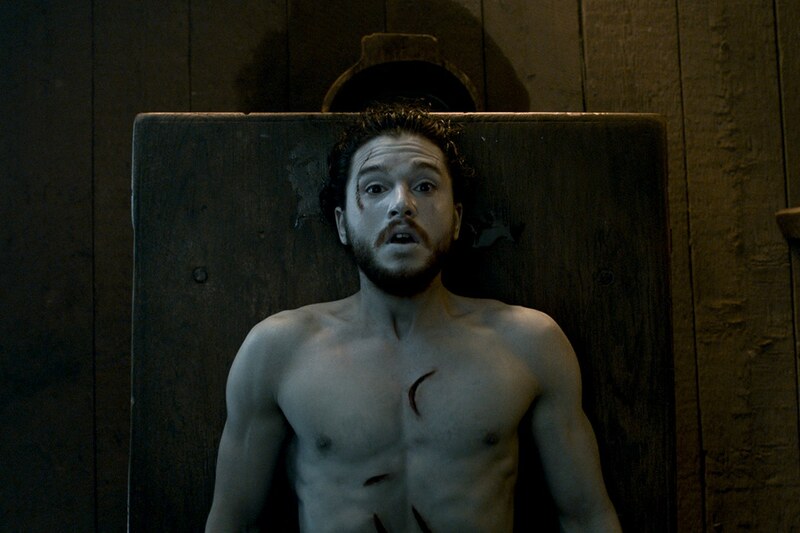 Cue the cheers, Jon Snow is actually alive! We have Melisandre and her spell to thank for that one. Bran, under the Three-Eyed Raven’s instruction, witnesses a scene from Winterfell’s past and learns that Hodor’s real name is Wylis. Tyrion takes one for the team and frees Danerys’ dragons. Ramsay kills his father, Walda and their newborn son in a very gruesome way to ensure that Ramsay is the only Bolton heir. Euron Greyjoy appears in the Iron Islands and kills Balon, creating a power battle in the family. In a vision, Bran sees a key moment from the past: His father Ned’s arrival at a tower where a pregnant Lyanna Stark was being kept by Rhaegar Targaryen (older brother of Daenerys), who’d stolen her away from Robert Baratheon. But before he can finish the memory, the Three-Eyed Raven stops him. Bloody Three-Eyed Raven. Arya FINALLY gets her sight back at the House of Black and White. Jon announces that his Night’s Watch time is over. The High Sparrow claims that Cersei must stand trial for her crimes. Ramsay comes into the possession of Osha the wildling and Rickon Stark. Jon tries to leave The Wall but is interrupted by Sansa’s arrival YAS! ; the two agree to fight together when Jon finds out that Ramsay has Rickon. Daenerys burns to death the Dothraki men who are keeping her captive, then bowls out naked, as Daario and Jorah arrive to try and save her. The High Sparrow has Margaery and Loras Tyrell in his prison. This episode is the tearjerker of the season. Bran has A LOT of visions; most prominently he sees when Hodor was Wylis. And while Hodor dies in real time while holding the door against a plethora of white walkers, Bran watches as Wylis starts screaming, “Hold the door! Hold… door! 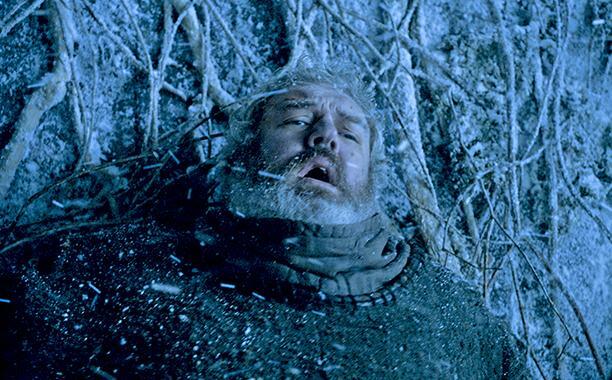 Hodor!” In the present, Hodor dies when the door breaks. SO MANY TEARS. Euron pushes Yara out of the way to rule the Iron Islands, but while he’s sealing the deal, she and Theon steal the Greyjoy ships and take off. A Red Priestess in Meereen tells Varys that Daenerys is the prophecied princess that was promised, but what does this mean!? Meera gets Bran away from danger, but they’re super close to becoming white walker food when hero Uncle Benjen, long believed dead, shows up to save them. He delivers the news that Bran ultimately will be the Three-Eyed Raven. Huh?!! When Arya can’t kill someone J’qen told her to, he sends The Waif after her. Margaery brings Tommen into the faith, effectively handing rule of King’s Landing to the High Sparrow. Jaime is stripped of his Kingsguard post and banished from the city. The peaceful commune where The undead Hound is currently living is taken over by murderers and thieves. Margaery slips her grandmother a note indicating she’s less brainwashed-by-the-High-Sparrow than she appears. Jaime and Bronn arrive at Riverrun, which is under siege from the Freys. The Waif attacks Arya just after little Lady Stark books passage on a boat back to Westeros. Tommen gets rid of trial by combat, which pisses off Cersei. Brienne runs into Jaime at Riverrun, where she’s come to recruit the Tullys to Jon’s cause. Edmure Tully surrenders the house to the Frey/Lannister armies; Brynden “Blackfish” Tully dies in the fight. Daenerys returns to Meereen, via dragon of course, to find the masters attacking the city. Best.Episode.EVER! Daenerys, with help from her dothraki army and her dragons, annihilate the masters’ forces. Then she agrees to support Yara’s bid for the Iron Islands in exchange for using the Greyjoy ships for her own purposes. Ramsay challenges Jon to a battle, then kills Rickon at the start of the fighting. Jon escapes loads of near-death experiences, then Littlefinger arrives with replacement troops that help the Stark family win the battle. 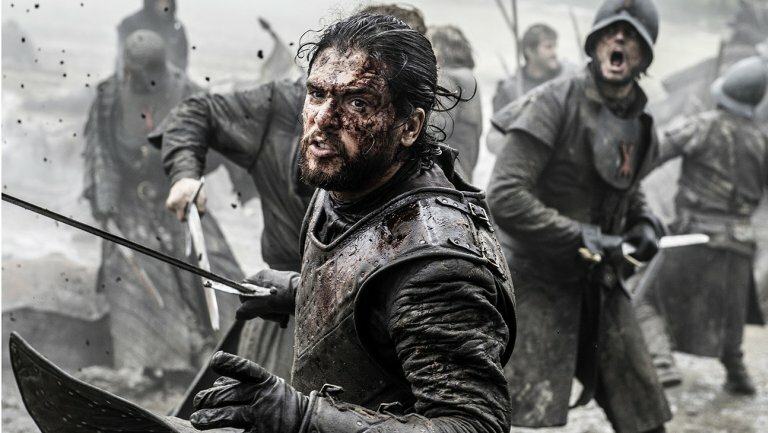 Jon and his men retake Winterfell, then he beats Ramsay nearly to death. 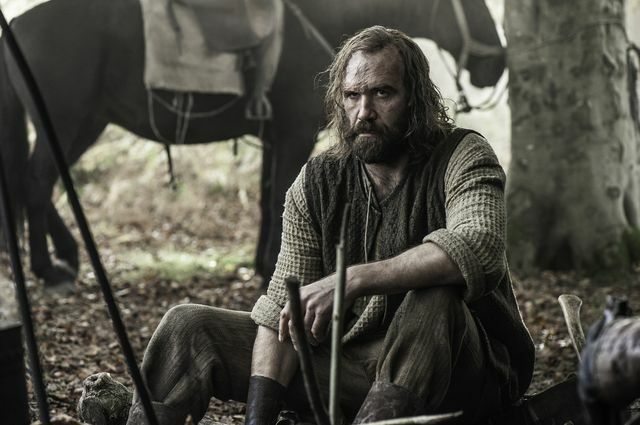 But his fate is left in Sansa’s hands, who lets one of her husband’s savage dogs into the cell where he’s being kept. It tears his face off and kills him. BYE BYE RAMSAY! On the morning of her trial at the Sept of Baelor, Cersei refuses to attend. That’s because she — with Maester Qyburn’s help — has rigged the place with enough wildfire to obliterate it completely. Loads of people die, including: Margaery, her father, Loras Tyrell, the High Sparrow and Lancel. When Tommen realizes what happened, he jumps out his window and kills himself. Arya gets some human-pie filled revenge on Walder Frey and kills him as payback for his role in the Red Wedding. The northern families deem Jon “King in the North” and pledge to help him fight the impending White Walker threat. Daenerys officially makes Tyrion the Hand of the Queen. Bran returns to his vision of the tower and witnesses Lyanna Stark dying just after giving birth to Jon, whom she hands to Ned and makes him promise to raise as his own. This confirms a long-held fan theory that Jon is really a Targaryen. WOAH! 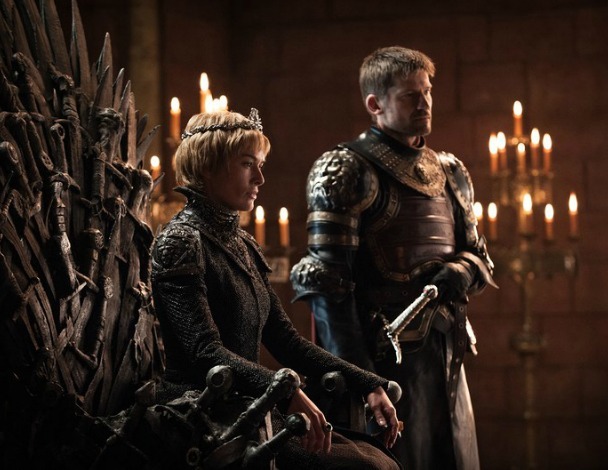 Jaime returns to King’s Landing and is horrified to see what’s happened — including Cersei now on the throne — in his absence. Daenerys, her dragons and the Ironborn Navy set sail for Westeros. A white raven from the Citadel arrives at Winterfell: “Winter is here,” Sansa says as it begins to snow.